FileThis provides a free application for uploading documents to your FileThis account. The application places a “watched” folder on your hard drive that functions as a drop box. Whenever you have a document you want to upload, drag it to the FileThis Drop folder. The document is immediately—and securely—removed from your computer and uploaded to your FileThis account. A benefit of using the FileThis Drop application is that you can drag entire folders of information from your hard drive to the FileThis Drop folder. The application will sort through all the subfolders and files, and then upload all documents in a supported file type (jpg, tiff, bmp, gif, pct, png, and psd). Add Documents: To use FileThis Drop to upload documents to your FileThis account, simply drag any selected document(s), or folders to the FileThis Drop folder. Move or Copy Documents: Note that the files are moved to your FileThis account and removed from your computer. If you prefer to copy the files, press Option/Alt as you drag the files to the FileThis Drop folder. 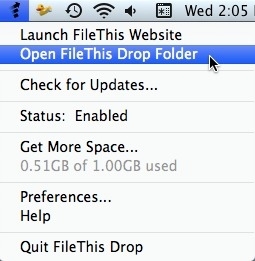 Open FileThis Drop Folder: For quick access to the folder, choose Open FileThis Drop from the main menu. Add Scans: If you are scanning documents to your computer, save them in the FileThis Drop folder so they are automatically delivered to your FileThis account. 1. Using your preferred web browser, login to your FileThis account. 2. Click the Upload tab, then click Download Installer for FileThis Drop. 3. Click Save to download the installer for your operating system. 4. Follow the prompts to install FileThis Drop on your computer. 5. Follow the prompts to set up your FileThis Drop application. Account: Enter the email address and password associated with your FileThis account. FileThis Drop Location: If you want to change the location of the watched folder, you can do so here. General: Specify whether FileThis Drop starts up with your system and how you receive notifications about updates. Welcome to FileThis Drop! Get started now by checking Open My FileThis Drop Folder Now and clicking Finish. The application adds a FileThis Drop folder to your desktop (or specified location) and a FileThis icon to your menubar (Mac) or system tray (Windows). To upload documents to your FileThis account, simply drag any selected document(s), folders, or hard drives to the FileThis Drop folder. The documents are moved to your FileThis account and removed from your computer. If you prefer to copy the files, press Option/Alt as you drag the files to the FileThis Drop folder. Tip: If your FileThis Drop folder is not on your desktop, choose the Open FileThis Drop Folder option from the FileThis Drop menu. To customize FileThis Drop, choose Preferences from the FileThis Drop menu. Location: Click the Change button to specify a new location, such as the Desktop, for your FileThis Drop folder. When you’re finished changing preferences, click the close button in the upper-left corner.